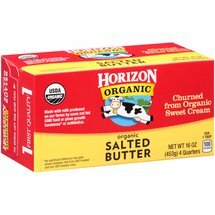 Churned from organic sweet cream,Kosher dairy,Delicious Horizon Organic Butter begins with organic sweet cream produced without the use of antibiotics, added growth hormones, pesticides or cloning. Our organic cream is produced in partnership with more than 475 family farms, with kindness to cows and the earth. Our farms produced this cream without antibiotics, added growth hormones, pesticides, or cloning.